If your thinking of a condominium, in the Fort Lauderdale real estate market, Hampton East Condominium in the Coral Ridge area of Fort Lauderdale may be one you wish to see. Read more about Hampton East Condominium which is located at 1308 Bayview Drive, Fort Lauderdale, FL. The Fort Lauderdale Real Estate market is certainly showing signs of a come back, and inventory in the entire Broward County area is starting to tighten. This Bayview Drive condominium is located directly of the middle river with ocean access dockage. 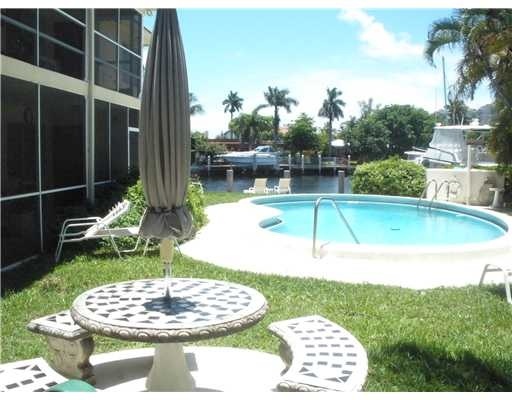 This condominium features a community dock and a waterfront heated swimming pool. This building has been completley renovated including a new roof. Building is only ten exclusive condominiums, and rentals are no allowed. At Eric Miller and Associates, "We're here to help" with your next Hampton East Condominium purchase or sale. Contact us directly at (954) 383-8170.